This convertible tablet is for the scribblers of the world. Stylus computing is nothing new, but the Yoga Book’s full commitment to it is. 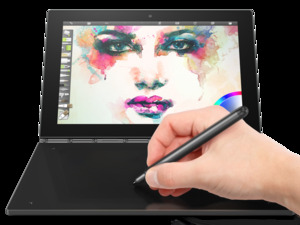 Its defining feature is a large, touch-sensitive surface that converts easily from a keyboard to a digital sketchpad. A proprietary pen, and a special way to use real paper with the digital sketchpad, turn the Yoga Book into a device where typing, drawing, and writing are equally welcome input methods. You can also write and draw on the touch display, of course, but we all know that holding one’s hand in the air isn’t as comfortable as working on a flat surface. Reviewing a product that’s the first of its kind requires some balance. You can’t just give it five stars for being first. You also can’t slam it for falling short of an ideal, because it can take a few iterations for a good idea to become great. Like most first products, the Yoga Book has some shortcomings. But after a week of using it, I’m more interested in how it lets me be more hands-on and tactile than I am disturbed by anything else. I felt the same way about HP's Sprout, which has a similar goal, tackled in a completely different way. To show you what I mean, let’s grab the pen and get started. The Yoga Book’s Real Pen can use a stylus or an ink nib. The Yoga Book’s touch surface consists of Gorilla Glass with a matte-painted, anti-glare finish. Tap a small pencil icon along the top margin, near the hinge, to toggle between the backlit Halo Keyboard (which I’ll describe later) and the Create Pad drawing surface, which offers 2,048 levels of pressure sensitivity. The pencil icon will light when Create Pad is active. An electromagnetic resonance (EMR) film underneath the glass, driven by Wacom’s Feel technology, lets the Create Pad work with the Yoga Book’s included Real Pen (a $40 value). Unlike recent stylus models you’ve seen from Microsoft and Apple, the Real Pen does not need to be charged. You just choose your nib and use it—either the digitizing stylus for writing directly on the Create Pad, or the real-ink pen for writing on paper laid over the surface. You can write on the Create Pad surface with your stylus, and it transfers your work to the screen in any compatible application (such as Microsoft OneNote). The method of changing from stylus to ink is awkward. You use a hole in the top of the pen cap to pull out one nib and shimmy in another. I’m thinking of those four-color ballpoint pens, where you can extend or retract a color with a click, and wondering whether Lenovo could do something like that instead. At the least, it would be nice if you could store the unused nib in the pen—I don’t want to have to keep track of (and most likely, lose) a skinny little thing like that. You also need to be careful not to use the ink pen directly on the Create Pad—which I did many times. I’m not blaming the device for my own errors, but I’m suggesting the Real Pen could use more idiot-proofing. When you toggle to Create Pad, it automatically opens Microsoft’s OneNote application, where you can write notes or draw, saving everything to the cloud. The Create Pad’s matte surface is easy to write on—not slippery, as tablet or smartphone glass can be. You can also use any other writing or drawing application, from something as simple as Windows’ Sticky Notes to a dedicated creativity program like Art Rage, a trial version of which comes with the Yoga Book. Drawing on paper felt more natural than drawing directly on the Create Pad. In another first for Windows devices, you can use paper on the Create Pad—any paper, placed atop the surface and drawn on with the Real Pen (and its ink nib). You could reasonably argue that there’s no need to use paper with the Create Pad surface. I like having the paper option, though. It feels more natural to use a pen on paper and see what I’m doing directly underneath my hand, especially when I’m drawing. Lenovo makes it easier to use paper with the Yoga Book by bundling Book Pad (a $20 value), a leatherlike base with brackets to hold small, A5-size notepads (similar to the 5x8-inch notepads used in the United States). The Book Pad gently affixes itself to the Create Pad with magnets. Lenovo sells high-quality paper to go with the Book Pad (75 sheets for $15), but you can buy any kind. While all of the Yoga Book’s writing and drawing accessories are useful, their quantity could be a hassle. Start with the device plus the pen with two nibs. Add the Book Pad base and Book Pad (or other) paper, and of course, the AC adapter and cable. That’s a lot to juggle, and the optional $35 cover for the Yoga Book doesn’t seem to offer enough room to store them all. The Yoga Book’s Halo Keyboard is backlit and learns your typing style for better accuracy over time. The Yoga Book is no more productive than a tablet unless you can type with it, and that’s where the Halo Keyboard comes in. It’s a backlit image that appears when you toggle off that pencil icon near the hinge. The keyboard is full-size, with function and cursor keys, as well as a small Windows key. Keyboards are a very personal experience. I have many friends who hate touchscreen keyboards, and I do, too—if they’re the smartphone or tablet experience on slick display glass. The Halo keyboard offers that matte texture for grip, plus audio and haptic feedback. The Halo Keyboard is capacitive and offers both haptic and audio feedback. Typing will feel a little slow at first, but Lenovo created special algorithms to adjust the keyboard to your typing habits. I had almost no trouble using this keyboard, and in fact I liked the relief from pounding on physical keys. I’ve always loved using Windows 10’s touch capabilities to navigate onscreen, but the Create Pad and the Halo Keyboard on the Yoga Book let me do far more than tap icons. Lenovo needs to refine the accessories a bit, but the Yoga Book’s still a superior implementation to what you might already have experienced with a touchscreen laptop or Windows tablet. Having established the Yoga Book’s stylus creds, it’s time to look at its fundamentals. The specs are modest. It dwells in that gray area between computer and tablet where limitations are part of the package. If Lenovo’s goal was to get the Yoga Book close to the size and heft of a pad of paper, it got pretty close. This device is an extremely thin 10.1 x 6.72 x 0.38 inches. I can barely feel its 1.52-pound weight on my lap or in my bag. 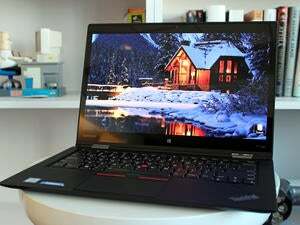 Thanks to its trademark Yoga 360-degree hinge, you can use the computer spread out flat, tilted like a clamshell, folded over like a notepad or tablet, or anything between. The shell is a magnesium-aluminum alloy in just one color: carbon black. The smooth surface attracts fingerprints readily, which could explain why a small microfiber cloth comes in the box. When a device is this thin, connectivity suffers. Some ports simply don’t fit. The Yoga Book has a micro-USB and micro-HDMI port, and a slot that can take micro-SD (up to 128GB). Cameras include an 8MP rear and 2MP front. Finally, you get a 3.5mm headphone jack. The Yoga Book’s base has micro-USB, micro-HDMI, and a micro-SD/SIMM slot on its right side. The display is a 10.1-inch FHD (1920x1200 per Lenovo’s spec) IPS touch display, with 400-nit maximum brightness. It looks great, but note that a screen this high-res and this small means icons and text will be tiny (you can adjust the sizes for better visibility). Lenovo says the 8500 mAh battery should last up to 13 hours. That may be true for a situation where the Yoga Book is used for lighter tasks with sporadic breaks. In our intensive video rundown test (with brightness set to 250 nits and headphones attached for audio), it took 7 hours and 39 minutes to drain the battery to a scant 13% capacity, at which time it projected another hour or so of use. Lenovo’s Yoga Book is for people who need to scribble to express their ideas. Its huge touch surface helps users produce and save those ideas digitally, taking fuller advantage of the stylus- and touch-friendly Windows 10 than any other device has.